Our adaptable software offers precise information on buildings and facilities for decision-making, tailored to the needs of your organization. The real estate portfolio of a large company may contain thousands of sites around the world. Managing such a portfolio without appropriate tools can be time-consuming and laborious. Our system can be implemented quickly, and it will enable you always to keep your real estate data up to date and ready for comparisons. We can help you with gathering and maintaining real estate data. Read more about the commissioning project of a real estate portfolio. Manage your entire real estate portfolio with Optimaze. The Optimaze software keeps your space information updated and gathered in one graphical system. The comprehensive space management solution will show the savings potential in your facilities, encourage more efficient utilization of space in your organization and provide assistance for decision-making regarding your facilities. 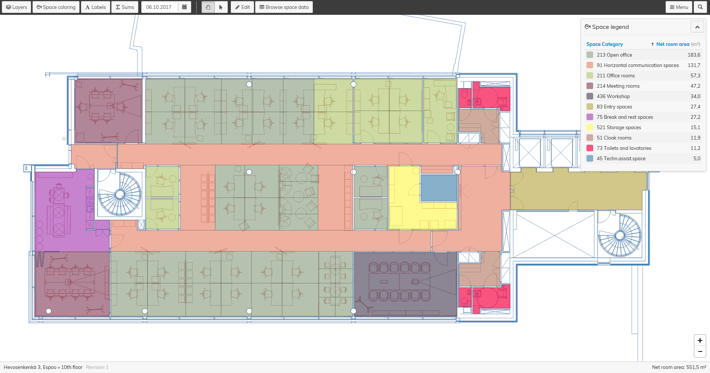 Optimaze shows your facilities in clear floor plans. 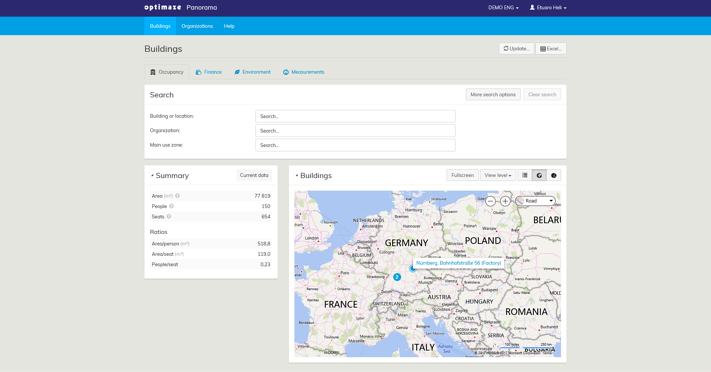 With Optimaze, you can manage space utilization and lease agreements, occupancy costs, and user data. Optimaze can also be integrated with your financial management, HR and external invoicing systems. 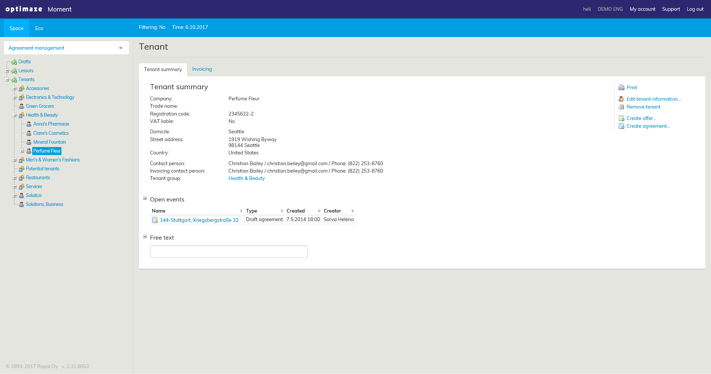 With Optimaze, you can manage your lease agreements or view your organization's tenant data. Service contract management enables you to manage the agreements between the customer, subscriber and service provider. The viewpoint and user rights are adapted according to roles. Most office space is wasted space, as its average space utilization rate is only around 40%. Measuring space efficiency in your organization is quick and easy with our IoT-based Optimaze Worksense occupancy sensors and measuring tool Optimaze Measure. Measurement data lays the foundation for the development of the workspace, allowing portfolio-level plans for the use of space to be drafted. 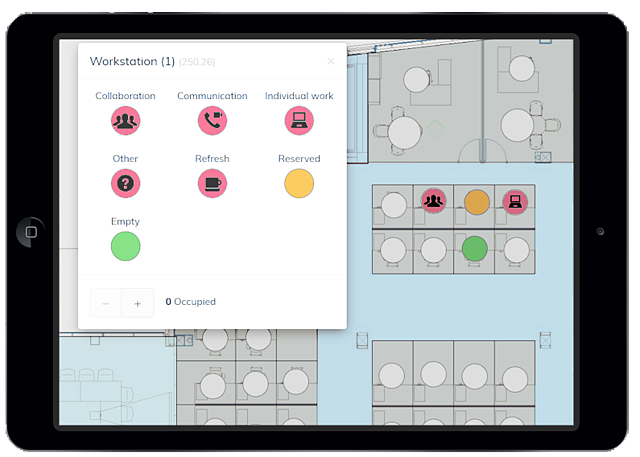 With Optimaze Measure you quickly record how workstations, ad-hoc seats, meeting rooms and other spaces are used. In the service sector, use of space is the cause of up to 70% of a company's key environmental impacts. Enhanced space utilization cuts down emissions as well as occupancy costs. We can help you measure the carbon footprint of your facilities and find the occupancy solutions to reduce the environmental impact of your organization. We can offer a complete environmental calculation tool or conduct the analysis for you – the solutions can be fully tailored to suit your needs. Where your facilities are located also plays a role in your carbon footprint. We take into account commuting to and from the workplace as well as business travel. We can, if you so choose, calculate a personal carbon footprint report for each employee in your organization. IWMS360° (Integrated Workplace Management System) is the real estate management solution for the digital age. It enables you to manage your real estate throughout its life cycle. IWMS360° offers tools for managing projects (construction, repairs, investments, alterations), space utilization and maintenance. The Optimaze software has been integrated to more than 70 systems. There are several standard interfaces available for transferring data to the Optimaze software and for making information available to external systems. Certain standard fields can be manually imported or retrieved through the user interface. During commissioning or expansion projects, it is possible to implement one-time mass imports of data (migrations) in the Optimaze software.